When thinking about my food creations and how to discuss them, nothing better described it than Sound of Music’s “A few of my favorite things” (I know, I know – I blame the Christmas TV special tradition for that reference 🙂 ). One of my favorite things growing up was rhubarb and apple crumble, which to this day I enjoy. However, if I am feeling a little more creative and have time on my hands, I take it a step further making individual rhubarb and apple pies. The individual pies came about while “window shopping” in one of my favorite stores, Crate and Barrel. I discovered a pie tray to make individual pies which I purchased there on the spot…..I love this equipment – http://www.crateandbarrel.com/individual-mini-pie-pan-set/s550322. 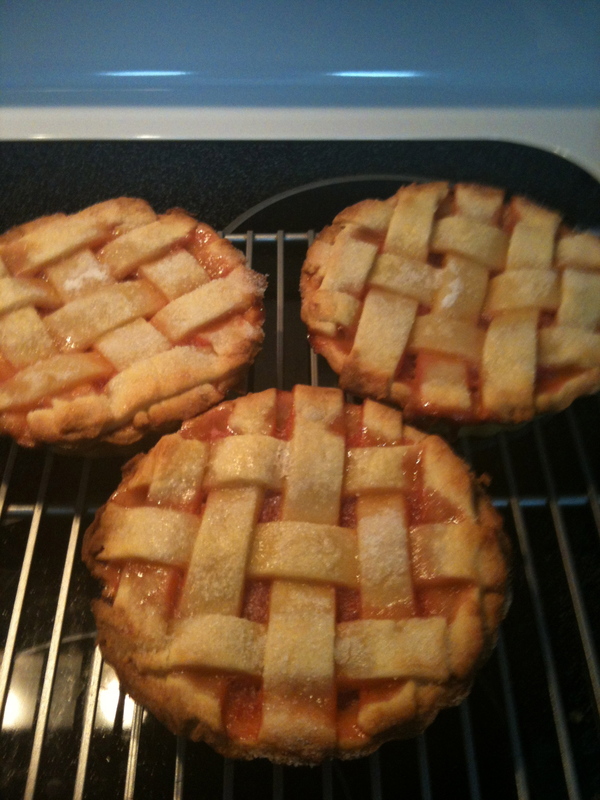 So once purchased, I had to prove to the hubby the value of the purchase – so why not make some pies. Here’s how…. Add all ingredients into a sauce pan, medium heat. Heat the ingredients, making sure you stir frequently. You don’t want the fruit or sugar to burn on the bottom of the pot. Once fruit starts to soften I turn the heat down to low-medium heat. Continue checking and stirring the ingredients as the rhubarb and apples become soft. This process takes ~15-20 minutes. Take compote of the stove top and allow to cool. I like my stewed fruit a little tart and also somewhat think – so add the initial the water and sugar but you should add to it to get your desired result. Just remember the Rhubarb and Apples will produce their own juices as well. I use a fork to help my pulp along – I use the folk to “mash” bigger pieces. Again this is a personal preference, I like my compote to be a little chunky. I usually have enough compote to split into containers and I store extras in the freezer. Make sure it is cold when placing in the freezer and in a airtight container. Sift flour and sugar into a large bowl, add butter. Rub the butter into the flour mix until it looks like crumbs. Make a well in the center, add yolks and mix flour mixture and eggs with a fork. Add water to the mixture with your fork. In the bowl, you should now be able to form a ball of all the dough. Place the ball of dough into plastic wrap and place in the fridge for 20 minutes. Preheat oven to 415 degrees F (or 210 degrees C). Brush rim of pie dishes with melted butter. Once 20 minutes has past, I take additional plastic wrap and place two pieces down on my countertop, place the dough on this “sheet” and flatten slightly. I add two additional strips of plastic warp on top. Roll out your dough (you want it to be less than 1/4 of an in. thick but not to thin). Cut the circle for the individual pies and press each pastry piece in place. 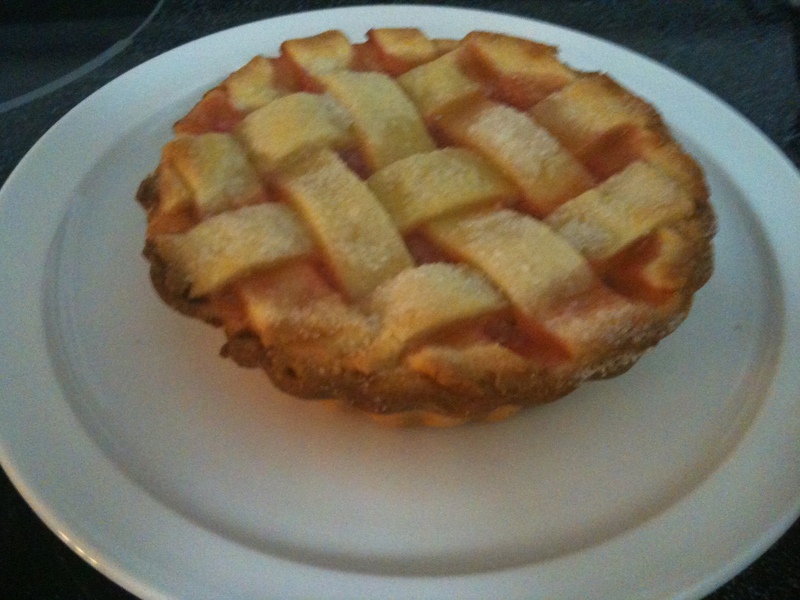 Measure out ~1/4 cup of rhubarb and apple compote and place into the pastry. For each pie, cut strips from the left over pastry – I use 7-8 strips about 1/3 in. (1/2 cm) wide. You may need to recall pastry and re-roll several times. On a board, you want to lay down 4 of the pieces parallel to each other with a gap in between each strip, then with the other 4 pieces lay them on top perpendicular. Now interlace the pastry strips creating a lattice. (This can be a little tedious). Lift the lattice and place over pie. I use a fork to push edges of the lattice pastry together with the bottom. Trim the edges. To finish brush top of lattice with egg white and sprinkle with 1 tbsp of sugar. Place in the oven and bake for 30 minutes or until golden. Take out of oven and let cool for 5-10 minutes. Remove from pan. Serve with vanilla ice cream or cream. Each individual pie can be split into two and shared, if you want that is. If the lattice pastry topping is too much, you could top with crumble instead. If this is the case, cut back to only making a single portion of the pastry. I use my Edmonds Cookbook for crumble recipe – specifically the rolled oats crumble http://www.firstsearch.co.nz/fruit-crumble.html. Now with this link you have a Rhubarb and Apple Crumble recipe, as well. This entry was posted in Uncategorized and tagged dessert, food, granny smith apples, pies, recipe, rhubarb, rhubarb and apple, rhubarb and apple crumble on September 3, 2012 by mlwilkie.